Working in the education and non-profit sectors, I’ve been to talks and conferences that fire up my passion – that make me want to leap out of my seat and do something. But I’ve been to at least as many with uninspired content, formats, speakers, or all of the above – gatherings where I wind up paying more attention to my Twitter feed than the human beings in front of me. The event in question – run by the Global Education Leaders’ Partnership (GELP) – brought together education system leaders, policy-makers, researchers and practitioners from 11 countries to talk about how to transform education. For people in this field, it isn’t a new conversation: we know well that 19th-century modes of education are not preparing young people to thrive today. We know we need to develop non-cognitive skills, like grit, empathy and creativity, and that communication and collaboration are more central to success than the ability to memorise facts. But what struck me about GELP’s approach was that the community really “practised what it preaches”: learner agency; skills development over knowledge transmission; and making space for people to think outside the box. Pre-reading. None of our five readings were very long – just 4 to 6 pages – and I read them all on the plane. But they were helpful jumping-off points that brought the ~70 delegates onto the same page from the start. Short “invited inputs”, where an expert gave a brief 15-20 minute presentation, followed by Q&A. Longer “learning labs”, where we worked in groups on project-based learning. Interactive breakaway workshops, where we got our hands dirty: analysing learner drawings or trying to master hands-on maths puzzles. Both the learning labs and interactive workshops pushed us to surface knowledge ourselves instead of conveying information – a much better way to learn! Whoever comes are the right people. Whatever happens is the only thing that could have happened. When it starts is the right time. When it’s over it’s over. The Law of Two Feet: If you find yourself in a situation where you are not contributing or learning, move somewhere where you can. A handful of us wrote our burning interests on pieces of paper, taped them to the wall and explained them briefly to the group. Then we self-organised into groups, and talked. This time was perhaps the most valuable of the event, yet took the least planning. It surfaced the rich knowledge and experience in the room; made space for informal discussions; and sparked new ideas and agendas. 4. Reflecting after learning. After the workshops, when 3 to 5 parallel sessions ran at once, we returned to our tables – called “home groups” – and spent 15-20 minutes reporting back on what we’d just learned. It pushed us to sift through lots of new information; helped us retain key epiphanies (we remember more when we teach something to others); and allowed us to learn from sessions we didn’t attend. 5. The stated intention to “generate forward momentum”. 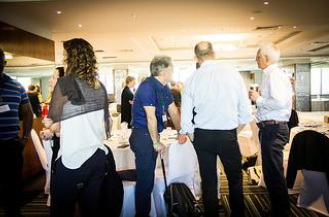 It’s too easy to leave a great gathering, motivated and inspired…get home…place the pile of conference-related papers on your desk, with every intention of building on connections and new ideas…and unearth them several months later. GELP events are held every six months; they emphasize agenda-setting and network building, and tasks are assigned to members in between events. GELP consciously doesn’t use the word “conference” to describe its get-togethers. The best phrase I can think of is that I’ve been part of a “co-learning event”. At DGMT, we seek to support creative learning approaches: where children are active drivers, work in teams, follow their passions and have opportunities to fail. In a world that too often clings to plenary lectures, PowerPoint presentations and moderated panel discussions – even when we’re talking about radically changing the status quo! 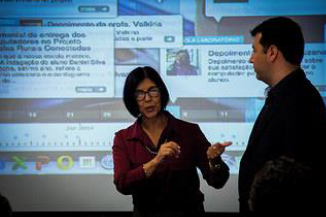 – the GELP summit was a great example of “creative learning for grown-ups”. 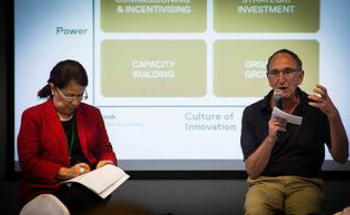 You can read more about the Global Education Leaders Partnership (GELP) event: Building Future Learning Systems: From exceptional innovations to systemic transformation here. My name is Thanduxolo Leon Novoyi and I am the Secretary at Siyahluma Youth Development Project, it is a child and youth focused organization based at Ngqele Location in the Eastern Cape Province. Thank you for the good work that you (DGMT) are doing to uplift our communities, and projects, especially in terms of small once-off grant, however I would like to know as to what other things that we can benefit from DGMT except money, such as trainings, conferences and other activities. The name of my project is Siyahluma Youth Development Project at Ngqele Location in the Eastern Cape Province. Hi Thanduxolo – On this website we try our best to give access to information and resources that might be helpful to civil society organisations – including sharing their experiences and lessons learned. Have a look at our articles filtered for our different portfolios – just open the portfolio page and scroll down to see them. In mid-August we are launching a new information product called: Create Change: Ideas. Tools. Experience. Our first issue will be on reading for pleasure and will feature various useful items like a presentation/podcast, infographics, tools and guidelines, reports on research and experiences from implementing organisations. The idea is that organisations and individuals can use these resources to help get South Africa reading and in that way start improving the life chances of our children. We tend to host small and very targeted strategic workshops with our implementing partners and others instead of large conferences. Our core work however is to support and partner with organisations and projects in civil society. Ultimately they provide the training and implement the programmes. That said, we strongly believe in the value of connecting people and causes. For example, just in terms of our partners – we know that there is an Activator working in Ngqele (contact Activate! http://www.activateleadership.co.za/ – for details). Nal’ibali (http://nalibali.org/), Fundza (http://www.fundza.co.za/) and Persona Dolls (http://pdt.org.za/) are operating in Umtata and Philani (http://www.philani.org.za/)in Coffee bay. The more we find ways to connect to each other, to enhance what each other are doing, to share our resources and what we are learning – the more we start to activate a movement to create change in our country. There is an Ethiopian proverb that says:”When spider webs unite, they can tie up a lion.” A connected movement is much more powerful than small unsupported individual efforts. So why don’t you try to make contact, learn what these organisations are doing, share what you are doing, see how you can complement and support each other’s efforts. Please keep us updated – you are welcome to send us short articles and pictures/videos of your work or about issues that you think are important – if we like it, we might publish it here. Our thanks and very best wishes for your work in Ngqele! Thank you Katie- this is a very helpful post- we are currently looking at putting a Summit together for our Shine Chapters, and I am sure some of the ideas you mentioned will be incorporated into our planning. Exciting to hear how effective you found GELP’s approach. Thanks for a great article which really gave us quite a lot of detail into your experience. You have now inspired us to totally change our Shine Chapters Conference into a Chapter’s co-learning event.